My favorite holiday macaron for this year is this eggnog macaron. Don't they look so festive topped with a little sprinkling of nutmeg? I made the frosting with a little more eggnog and less sugar than the original recipe called for. Just keep that in mind when making this eggnog frosting. I also made an Italian meringue for these macarons. You will need a scale to measure the weight of your egg whites, sugar, almond meal and water in order to use this method. Please have a look at Syrup and Tang's explanation for making macarons here. Place butter, sugar, marshmallow fluff, eggnog, and vanilla in a large mixing bowl. Beat on medium speed until smooth and creamy, about 3-5 minutes. Fill macarons then garnish with ground nutmeg. 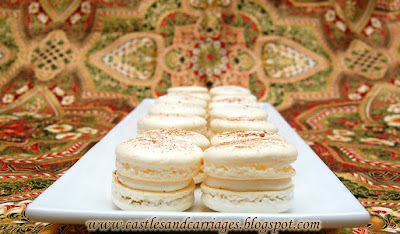 Hello, following you from your eggnog macarons post on Homemaker on a dime. Love your blog! Those are beautiful! So pretty, and delicious too. I want to get up the nerve to make meringues. Thanks for sharing on Crazy Sweet Tuesday!